Christopher is the Director of Innovation with the Global Alliance for Humanitarian Innovation (theGAHI.org), which is an initiative of the World Humanitarian Summit (2016). 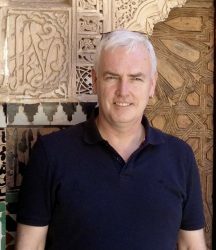 Previously, he was the Executive Director / Principal Research Fellow of the Centre for International Cooperation and Security (CICS) in the Department of Peace Studies at the University of Bradford, UK, where he worked on: the future of the international humanitarian system; catastrophic risk and global systems failure; and crisis – conflict management. He has served as a diplomat / Head (P5) of the International Peace and Security Department at the UN Staff College in Italy. He was also a Canadian diplomat / Senior Policy Advisor for ‘human security’ at the UN Security Council, UN General Assembly, G7-G8, EU, OECD-DAC, etc. He has directed emergency humanitarian field operations in 17 wars and two disasters in +27 countries in Europe, Africa and Asia for MSF, Red Cross, CARE, etc. (e.g., Rwanda Genocide, 1994). He has completed +750 news media interviews and consulted in the Philippines, Sri Lanka, London and New York.